Honoring women leaders, the Southwest Indiana Chamber has proudly hosted the annual ATHENA Award® Luncheon since the 1990s. Reflecting critical importance of women in the community, hundreds of local women have been nominated, hundreds of local women have been celebrated as Athenas, and 27 leaders have been recognized as ATHENA Award® representatives. Representatives of the ATHENA Award® are exceptional leaders in the Evansville-area community that have actively and generously assisted others in the attainment of professional excellence and leadership skills. 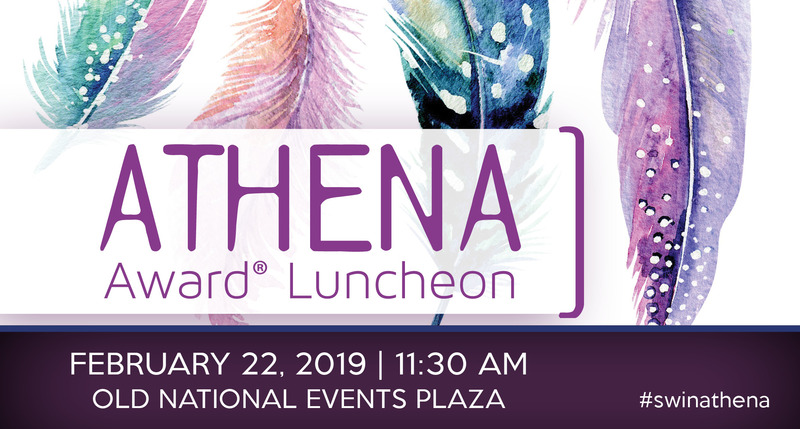 For more information about the ATHENA Award Luncheon, to purchase seats, or to inquire about sponsorship opportunities, email Karen Robinson, manager of events, or call 812-425-8147. Completed nominations received by Friday, Oct. 26, 2018 will be carefully reviewed by an impartial selection committee, and Athenas for the 2019 ATHENA Award will be announced at a press conference in early December. The representative of the 2019 ATHENA Award will be announced at the 28th Annual ATHENA Award Luncheon on February 22, 2019. Recipients of the ATHENA Award are exceptional leaders in the Evansville-area community that have actively and generously assisted others in the attainment of professional excellence and leadership skills. Provide examples of how the nominee demonstrates support for the advancement and leadership development of business and professional women, young professionals and/or students. 500 words or less. Provide specific examples of how the nominee demonstrates excellence, creativity and initiative in her business or profession. Describe the nominee's career path and specific accomplishments. 500 words or less. Provide specific examples of how the nominee has and continues to provide valuable service to improve the quality of life for others in her community. If possible provide length of service and offices held. 500 words or less. Include additional information that is important for consideration of your nominee. Include awards, honors, publications, articles and/or testimonials that demonstrate service to her profession, community, and, most importantly, aspiring and established women leaders. Please list specific references who should be contacted if nominee is chosen. 500 words or less. Honoring women leaders, the Southwest Indiana Chamber has proudly hosted the annual ATHENA Award Luncheon since the 1990's. Reflecting critical importance of women in the community, hundreds of local women have been celebrated as Athenas, and 26 leaders have been recognized as ATHENA Award Representatives. Representatives of the ATHENA Award are exceptional leaders in Southwest Indiana community that have actively and generously assisted others in the leadership skills. The 2018 Representative of the ATHENA Award was Chris Ryan CEO of the Women's Hospital. Title Sponsor - $10,000: Speaking opportunity at Athena Award Luncheon, Premium exposure on event related communications( print, radio, website, email, social media, etc. ), Sponsor recognition on event registration web page, 3 prominently located tables - 30 seats total, Recognition at event in program and opening remarks, Logo/company name recognized at the table. Presenting Sponsor - $5000: Premium exposure on event related communications ( print, radio, website, email, social media, etc. ), Sponsor recognition on event registration web page, 2 prominently located tables - 20 seats total, Recognition at event in program and opening remarks, Logo/ company name recognized at the table. Gold Sponsor - $3000: Exposure on event related communications, Sponsor recognition on event registration web page, 2 prominently located tables - 16 seats total, Logo recognition in event program, Logo/ company name recognized a the table. Silver Sponsor - $1100: Sponsor recognition on event registration web page, 1 reserved table - 10 seats total, Recognition in event program, Logo/ company name recognized at the table. Corporate Table Sponsor - $600: 1 reserved table - 8 seats total, Recognition in event program, Logo/ company name recognized at the table.